Chuck DeVore, a one-time member of the California State Assembly has moved away from the Golden State saying that liberals have destroyed his once beautiful and bountiful home. Not only does DeVore say that California is a cautionary tale, but he credits President Donald Trump with saving the rest of America from the same grizzly fate. Former State Representative Chuck DeVore, who served in the legislature until retiring in 2010, has announced that he is done with his home state and is now a proud resident of the Lonestar State of Texas. He moved right after he left the legislature, but a recent article by a pair of foolhardy leftists brought the reason he let into sharp focus. “The reason why this is an issue right now is you may have seen the CEO of Twitter Jack Dorsey tweeted out a piece by Ruy Teixeira (contending that) California is the future and that California is this wonderful utopia,” DeVore said on Fox News. DeVore recently appeared on Fox News to note why he left California: “If you’re a member of the working poor, if you’re anyone other than the elite from Silicon Valley and Hollywood, it’s tough to make ends meet, to put food on the table and put a roof over your head in California,” he said. First, he noted the poverty rate in California is 20.4 percent versus 14.7 percent in Texas, which is the second most populous U.S. state after California and also shares an extensive border (1,900 miles) with Mexico. In other words, the Golden State’s poverty rate is 39 percent higher than the Lone Star State’s. 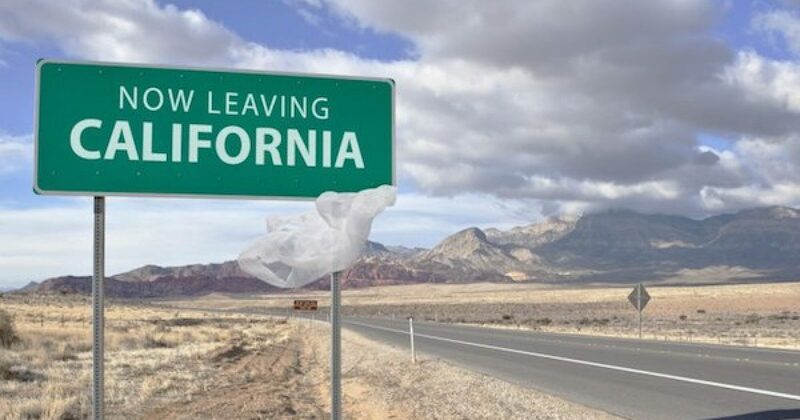 Additionally, DeVore noted that California for years has experienced a net out-migration, which has accelerated recently to over 100,000 people per year. CNBC reported that a net 138,000 people left the state in the 12 months preceding July 2017, while Texas gained 79,000 people during the same time period, and Arizona added 63,000 new residents. One of the main reasons people gave for leaving were California’s high taxes and housing costs. DeVore also noted that he bought a house in Texas for $110,000 and that money got him a house many times larger than what he could have gotten for the same cost in California. That home prices and rents in California average 55 percent higher than in Texas isn’t just due to the former’s good weather—the Golden State’s high taxes, capricious regulations, onerous lawsuit climate, and powerful unions all contribute to constraining the supply of new housing while jacking up the price of existing housing. Further, California’s soaring unfunded pension liabilities to its all-powerful government labor unions are at least $477 billion with the annual shortfall to fund the pensions hitting about $5.4 billion a year by 2024—swamping rosy claims of a state budget surplus. Lastly, California’s war on traditional and affordable domestic energy has resulted in among the highest energy costs in the nation, spurred on by high taxes and billions in greenhouse gas fees—fees earmarked to partially pay for a vastly oversold, over budget and years late high speed rail project that nervous voters are turning against. Of course, DeVore is exactly right. Just as he was posting his op-ed at Fox, the annual “Rich States, Poor States” study on the top performing (and bottom failing) states in the nation was released. And, probably unsurprisingly, the study finds California to be at the bottom of the heap in most metrics among our 50 states. According to the study, California ranked at a low, low 47th among the 50 in economic outlook. The Golden State has the worst top marginal personal income tax in the country, the 40th worst corporate rate, and ranks 50th in personal income tax progressivity — meaning that the more you make the higher the rate is that they take. It is also worst for employee freedom, is 50th in average worker’s compensation, and the worst right-to-work state of all. A state that did even worse than California is Illinois. The Land of Lincoln ranked a dismal 48th in economic outlook — and I think that is generous. Vermont ranked in at 49th worst. And, also unsurprisingly, New York ranked dead last as the 50th worst state for economic outlook. What is the common denominator in these three worst states in the union? They are all dominated by liberals, of course. Now that we have talked about some of the worst performers, here is the group’s video revealing the top ten best.